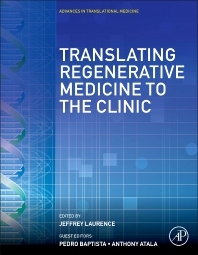 Translating Regenerative Medicine to the Clinic reviews the current methodological tools and experimental approaches used by leading translational researchers, discussing the uses of regenerative medicine for different disease treatment areas, including cardiovascular disease, muscle regeneration, and regeneration of the bone and skin. Pedagogically, the book concentrates on the latest knowledge, laboratory techniques, and experimental approaches used by translational research leaders in this field. It promotes cross-disciplinary communication between the sub-specialties of medicine, but remains unified in theme by emphasizing recent innovations, critical barriers to progress, the new tools that are being used to overcome them, and specific areas of research that require additional study to advance the field as a whole. Volumes in the series include Translating Gene Therapy to the Clinic, Translating Regenerative Medicine to the Clinic, Translating MicroRNAs to the Clinic, Translating Biomarkers to the Clinic, and Translating Epigenetics to the Clinic. Chapter 7. Cartilage and Bone Regeneration—How Close Are We to Bedside? 4. The Original Tissue Resident MSC: A Better Therapeutic Alternative? Dr Laurence is pursuing the pathophysiology of cardiovascular and skeletal abnormalities linked to HIV disease and its therapies at Weill Cornell. Dr Laurence is the editor-in-chief of Translational Medicine, which Elsevier co-publishes with the CSCTR.